One of Britain's longest serving bandleaders, Billy Cotton (born William Edward Cotton in London on 6 May 1899) was the host of The Billy Cotton Band Show , one of the most popular variety shows of the 1950s and '60s. A staple of the BBC 's Saturday night schedules for many years, the show attracted some of the biggest audiences of the period. Cotton formed his first dance band in 1924 and found national success via radio, primarily through his popular Sunday show, The Billy Cotton Band Show (1949-68). A national institution, Cotton 's show became as much a part of the traditional British Sunday lunchtime as roast beef. Cotton was initially reluctant at making the transition from radio to television, preferring to limit the band to sporadic appearances only, including Coronation Music-Hall (BBC, tx. 30/5/1953) and Celebration Music-Hall (BBC, tx. 15/5/1954). 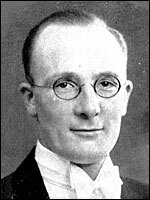 However, with the launch of independent television, Cotton was persuaded to sign for a series by his agents, Lew and Leslie Grade (the brains behind ATV ). Unfortunately, the series he made for ATV in November/December 1955, Saturday Showtime , (preceded by a one-off special, Wakey Wakey , tx. 6/10/1955) proved to be an under-rehearsed farrago, and Cotton declined a second series. Despite this setback, Cotton returned to the BBC to attempt the transfer of his radio formula to television. The series that was to bestow major success upon Cotton was launched on 29 March 1956 under the title of Wakey Wakey! , taking its familiar title of The Billy Cotton Band Show from 2 April 1957. Cotton also briefly hosted the variety series The Tin Pan Alley Show (BBC, 1956) . Initially a weekday show, The Billy Cotton Band Show transferred to Saturday evenings on 4 October 1958 (following a one-off on 11 January that year), where it remained for most of its lifetime. Up until May 1961 the show's title could vary between The Billy Cotton Band Show and The Wakey Wakey Tavern , with Cotton dressed in flowered waistcoat and bowler hat in the latter, and more formally in dinner jacket in the former. Otherwise, the formats differed little. From May 1961 the show remained as The Billy Cotton Band Show until October 1965, after which it saw out its days as Billy Cotton's Music-Hall . Preceded by Cotton 's cry (often in extreme close-up) of "Wakey Wakey! ", the band would launch into its theme tune, 'Somebody Stole My Gal', heralding the start of another exuberant show of song, dance, comedy, and general knees-up jollity. Cotton was supported on most shows by regular singers Alan Breeze and Kathie Kay , and the twelve-girl dance group, The Leslie Roberts Silhouettes , who Cotton , despite advancing years, would always accompany. The series also launched careers, including Russ Conway (who was awarded his own BBC television series in 1960), Mrs. Mills , Ted Rogers and Roy Hudd , the first three becoming regulars or semi-regulars following their first appearance. Cotton was presented with an Ivor Novello award in 1959 and voted Show Business Personality of the Year in 1962. The series never witnessed a decline in popularity, with only Cotton 's death from a heart attack on 25 March 1969 bringing it to a close. The final show was transmitted on 20 July 1968.